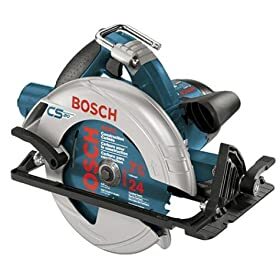 The Bosch 15 Amp 7-1/4-Inch Circular Saw with Direct Connect features a powerful high-output motor, and professional grade ball and roller bearing construction. The 5500-rpm saw can cut 2-7/16-inches at 90-degrees, 1-5/8-inches at 50-degrees, and 1-7/8-inches at 45-degrees. An aluminum footplate ensures a stable cutting surface for the lightweight 10.3-pound saw. Other features include soft-grip handles for added comfort, a built-in saw hook for convenient saw storage, wrench storage built into the handle, and a dust blower for greater dust control. The unit features a unique line-of-site cut visibility that provides a clear, unobstructed view of the cut line. The saw also has a 56-degree bevel capacity, with positive detents at 22.5 and 46 degrees. Finally, the innovative Universal Direct Connect cord management system prevents problems with snags, damaged cords, and repairs. 15 Amp 7-1/4-Inch Circular Saw with Direct Connect, 24-tooth carbide tooth blade, wrench, and job site toolbag. Never really got to use the saw because of the safety recall and the possibility of an "amputation" if I chose to ignore the recall. While this was a minor problem the problem with the plastic base plate would have been a lifetime pain! The base plate lacks dimensional stability in that it will not accept the rip fence insertion without a significant use of force and again more force or a rubber mallet is called for if you need to move it to your desired rip dimension. Additionally the set screw for the rip fence comes with a spring that is to long thus requiring more force during all my aborted attempts to screw it into the base plate! I further found it physically impossible to screw the set screw into the base plate without the spring in place! I own a lot of Bosch tools and have never experienced these kinds of problems with Bosch or any other brand. I returned the saw to the vendor I purchased it from citing poor tool quality as the reason. The blade won't cut but instead burns through the wood. I have followed the instructions to a "T". Bosch CS20 , much better out there ! I am a professional carpenter. I have had my Makita saw for 24 years and wanted a change, The Bosch CS20 looked like it had some pretty good features and the balance was not bad. After 3 months the composite foot plate has warped making for gouged cuts. I cannot cut a true 45deg bevel with it because of this flaw. The detents are not adjustable. My 45deg locks in at 43.5 deg. This is ubsat in my line of work. Bosch is going to send me another foot plate and bevel indicator but its the same material as the one I have. Bosch NEEDS to produce a replacement aluminum plate like all other quality saws have. They have missed the boat big time in this area. Based on this I would not recommend this saw for the serious tradesman. i've used this bosch CS20 quite a few times since i bought it, on jobe and arround home for remodle. the only thing i could hope for is for this saw to also be battery powered as well (if that were at all possible)my overall openion is this is a great tool with plenty of power. I read all the reviews then finally picked this one over the PCMag saw because if was $40 less. I loved using the saw at first. It has a great line of sight and is quiet and runs smooth. having an extra long cord is a awesome feature, but it did add $20 to the cost. but now after 6 months the base plate is warped making it a pain when cutting expensive oak plywood. It rocks from the back left to the front right over 1/8". I put an email in to Bosch about a replacement plate but I am scared it will be the same thing and fail again after another 6 months. Should have spent a little more and got the PC. 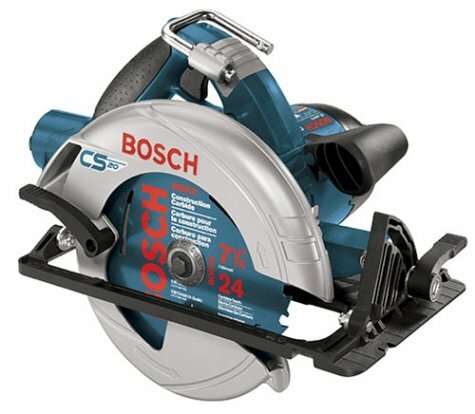 The Bosch CS20 is the best circular saw I've ever used. It has power to cut through the toughest jobs. The direct connect cord is best explained by - "why didn't someone think of this before?" The hook hangs the saw perfectly on rafters, joists, and saw horses. This saw is light and tough. This saw is sturdy and extemely well made. The final selling point is that it bevels to 56 degrees. This saw is the whole package. This was the first Bosch tool I purchased and was impressed. I bought it to replace an almost antique Craftsman that served both my father and myself very well. I liked the idea of the direct connect and the rafter hook. The composite base was a little novel to me but I decided to try it anyway. I have seen the reviews with complaints of the base but have not had any of the problems, I have not dropped my saw from a roof but I haven't exactly babied it either. The first use was on wet treated lumber for a deck and it performed flawlessly. The saw has great line of sight and is comfortable in hand. You dont get a blast of dust in your face like you do with some saws. The blade that came with the saw very good and lasted quite a long tie. My saw was made in the USA but I have seen that some are made in China which I always try my best to avoid. I don't know if they are all made there. Mine also came with an excellent 25" cord that coils very nicely in the bag with the saw. I was a little leary of the bag instead of a plastic case but have come to like it.